Edible wild mushrooms should only be collected by experts in identifying the ones that are safe to eat, but anyone can grow shiitake mushrooms and enjoy without a care. Shiitakes (Lentinus edodes) are prized in Japan for their flavor and medicinal qualities. “Shii” refers to the type of tree most commonly used in production (a relative of our oak) and “take” means mushroom. In one afternoon, you can prepare a few mushroom logs that will put shiitakes on your dinner plate for the next two to four years. The basic method of growing mushrooms on logs is that you drill holes, plug the holes with “inoculum” or spawn (the mycelium growth of the fungus), and once the mycelium has grown throughout the log, it fruits and produces mushrooms. It takes 6 to 12 months for the mycelium to fully colonize the log and provide their first wave of these culinary delights. You can expect spring and fall harvest periods without doing anything, and more fruiting if active techniques are used. The best trees to use for shiitake production in North Carolina are red and white oaks and sweetgum. Cut the trees while they are dormant, ideally in late winter or early spring before the sap has risen. 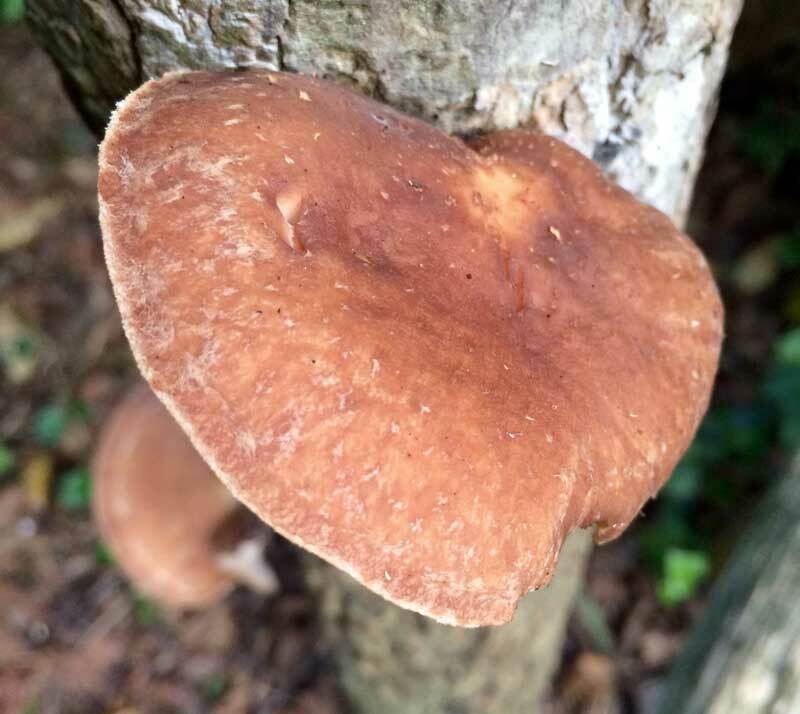 Because trees have some natural anti-fungal agents in them (remember, mushrooms are fungi) you want to wait at least 10 days after felling the tree before inoculating with shiitake, but don’t wait longer than two weeks to a month as the wood will dry and not readily colonize. 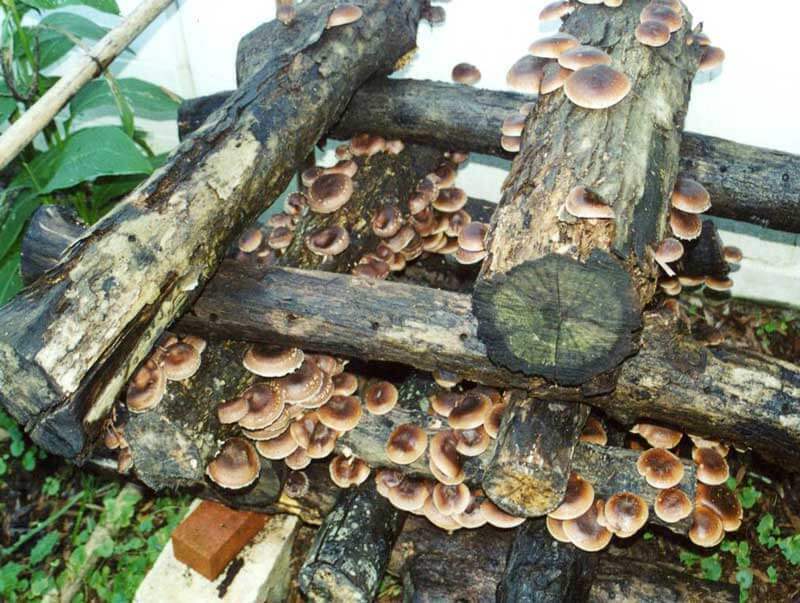 Handle the logs carefully to prevent bark damage, which allows contaminating fungi to compete with the shiitake. Cut the 4 to 8-inch diameter logs into lengths that you can move around—no more than 3 to 4-feet long. Order the shiitake spawn online ahead of time and store in the refrigerator. Ask the source for a variety of warm, cool and mixed season spawn, so you can experiment with what strains do best in your location. You can purchase the spawn in a sawdust form or in short dowel form (called plug spawn). 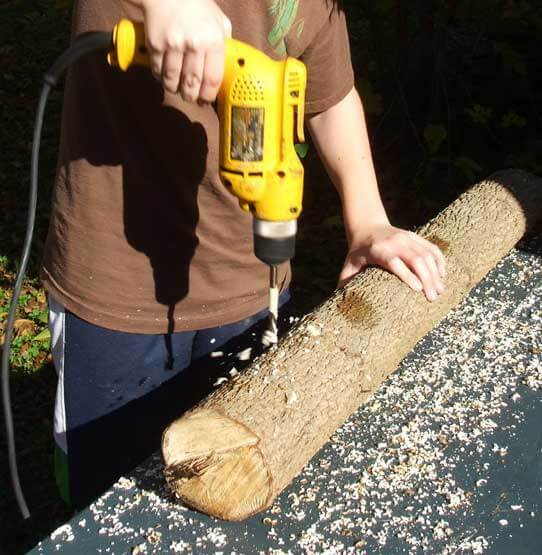 The sawdust form requires a plunger—about $30—to insert the spawn into the logs, whereas the plug spawn can be tapped in with a hammer. I have used both with success. 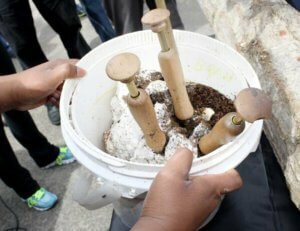 When you are ready for the big inoculation day, you want to have ready your logs, the mushroom spawn, a drill with a bit that fits your dowel or plunger, a hammer, and melted beeswax or cheesewax with a brush to apply. Mushroom log inoculation is a great group or neighborhood activity. 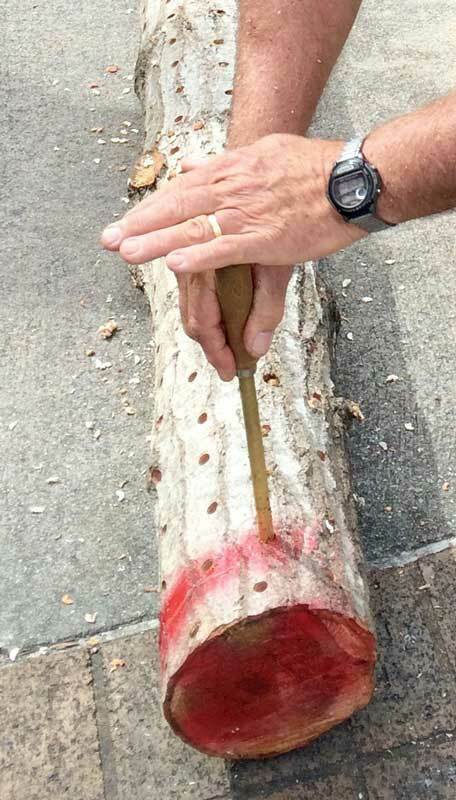 Drill holes down the length of the log, starting one inch from the top and about 3-inches apart. You want the hole deep enough for the plug to go completely inside with a slight indentation. Move 3 to 4-inches over to start the next row and stagger the holes with the first row. Once the log is drilled all around, take the spawn and either tap the plug or plunge the sawdust into each hole. Take a brush or wax dauber and cover each plugged hole with wax. This is to prevent contamination of the log with other fungi. 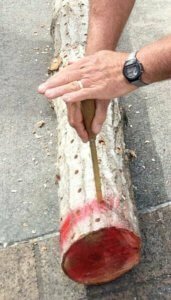 You can also paint wax on the cut ends of each log and on any nicks in the bark for protection. You are done. Now open stack the logs using a layer of non-plugged logs on the bottom or lean the plugged logs against a wall in an area that gets some light, but not direct sun. The shade of pine trees or the north side of your house are good sites. We keep ours between our mammoth camellia and our neighbor’s hedge so it’s shady and cool. If the summer has a dry spell, giving the logs a long soaking is better than a frequent quick squirt. When the weather starts to change in the fall, particularly after a rainy spell, you can expect to see some buds on the logs where you plugged them, and in a week or so, start cutting the mushrooms from the logs. The shitakes can be snapped off, but you risk pulling the plug from the log. For our home use, we have about 10 to 15 logs in various stages of growth. We add 3 to 5 logs each year as the older ones rot. From each mature log, expect to harvest about 1.5 pounds of mushrooms per year, and perhaps 4 to 5 pounds over the log’s lifespan of 2 to 5 years, with big logs slower to produce, but producing more years. If you want to push the production levels, you can induce fruiting by throwing the logs in a tub for 24 hours. You can repeat this every four to eight weeks, up to three times per year. I have even heard you can “shock” them into production with an electric cattle prod but I can’t vouch for this method, so stick with patience or a good soak to get the mushrooms growing.